The book was edited by Ulla Carlsson and Reeta Pöyhtäri and published in May 2017 by Nordicom at the University of Gothenburg in Sweden. 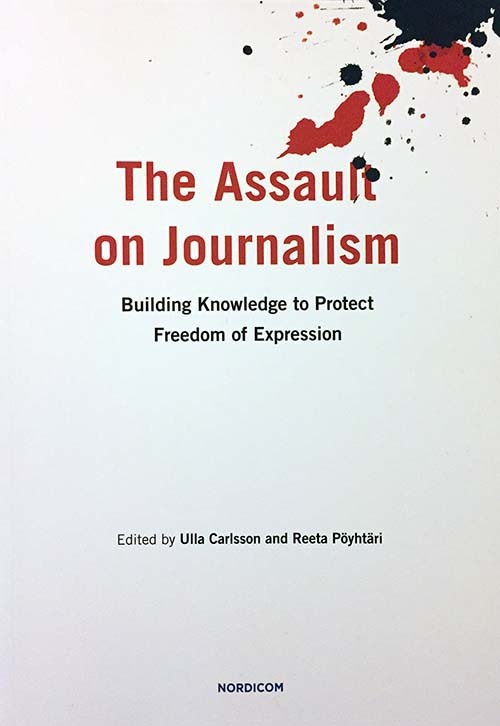 The chapter, “Journalism Schools Must Include Safety Courses in Curricula,” was based on an urgent call she made at the 2016 UNESCO World Press Freedom Day conference in Helsinki, Finland. Too many journalists are victims of violence and impunity, and more should be done in academia to prepare media students for the perils they are likely to face. I urge all faculty members at this conference to incorporate a course on safety for journal­ists in their curricula. It’s not a luxury; it’s an urgent necessity. According to the United Nations Educational, Scientific and Cultural Organization (UNESCO), one journal­ist is killed every five days in the line of duty and the impunity of such acts is unabated. Unlike the issues of journalism and freedom of expression, journalists’ safety has not been a popular topic of academic research. It has rarely been discussed as a specific research question, much less in practical courses…. 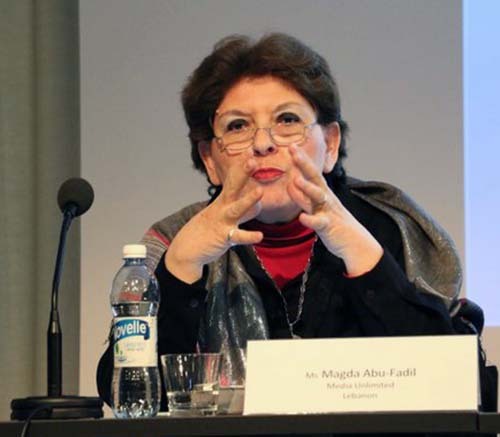 The “Model Course on Safety of Journalists” on which she worked is now in print in English and Arabic and will be online on the UNESCO and IFJ websites. Too many journalists are victims of violence and impunity and more should be done in academia to prepare media students for the perils they’re likely to face. 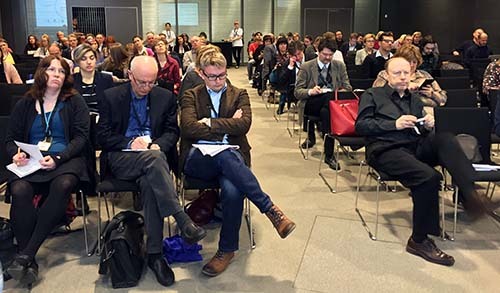 Abu-Fadil was addressing the UNESCO Research Conference on Safety of Journalists in connection with World Press Freedom Day in May 2016 the Finnish capital. 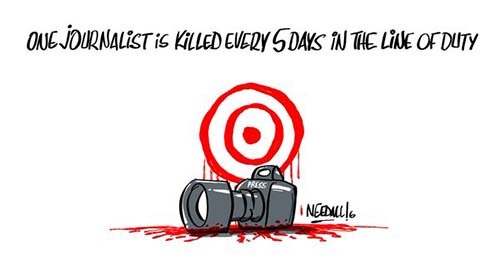 According to UNESCO, one journalist is killed every five days in the line of duty and the impunity of such acts is unabated. Unlike the issues of journalism and freedom of expression, journalists’ safety has not been a very popular topic of academic research. It has rarely been discussed as a specific research question, much less in practical courses. 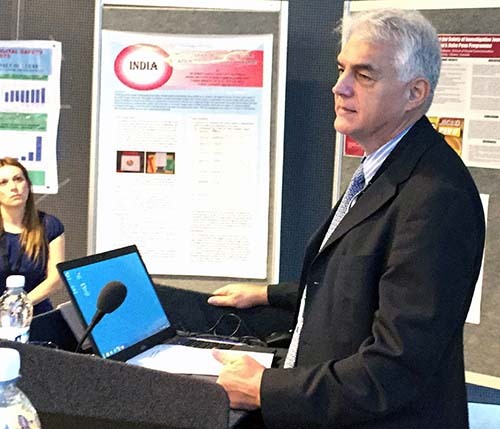 “Press freedom depends on safety,” noted Guy Berger, UNESCO’s director of the Division for Freedom of Expression and Media Development at the opening of a parallel research conference, adding that 95% of attacks on media staffers are never resolved. Abu-Fadil participated in another session on new frontiers in disinformation and the use of propaganda. Panelists discussed various aspects of media’s misleading messages, hate speech, phony photographs and visuals, manipulation by terrorist groups, and, the proliferation of news websites as a counterforce to government-controlled media and corporate monopolies. 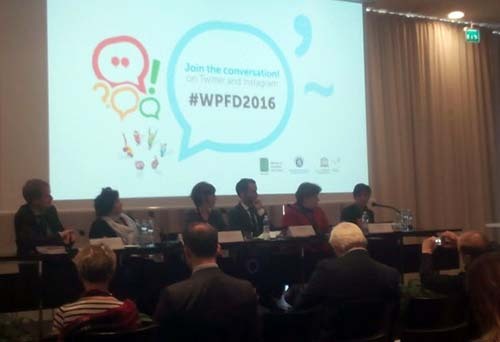 This year’s WPFD coincided with the 250th anniversary of the world’s first Freedom of Information Law in Sweden and Finland. Finland was part of Sweden at the time. The “Freedom of the Press Act 1776” passed by Sweden’s parliament abolished preventive censorship and made political debate – including criticism of the country’s rulers – permissible. But religious texts remained subject to prior censorship. 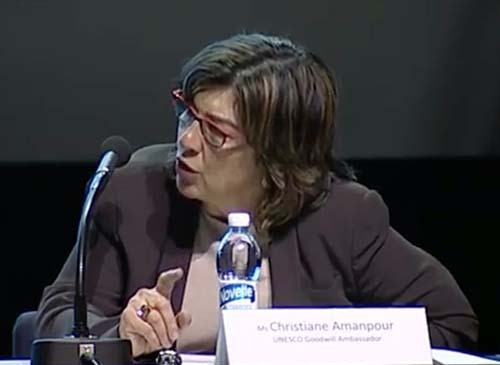 “We need governments to be accountable and transparent,” said CNN chief international correspondent Christiane Amanpour, UNESCO Goodwill Ambassador for Freedom of Expression and chair of a plenary session entitled “Protecting Your Rights – Surveillance Overreach, Data Protection, and Online Censorship”. The session focused on the importance of freedom of expression for sustainable development, democratic governance, and intercultural dialogue, notably in post-conflict environments. The three-day conference, including off-site activities, was packed with sessions focusing on media coverage of the refugee crisis, artistic freedom, whistleblowers and source protection, hate speech and ethics, gender issues, and freedom of information. The conference culminated in the Finlandia Declaration on Access to Information and Fundamental Freedoms.